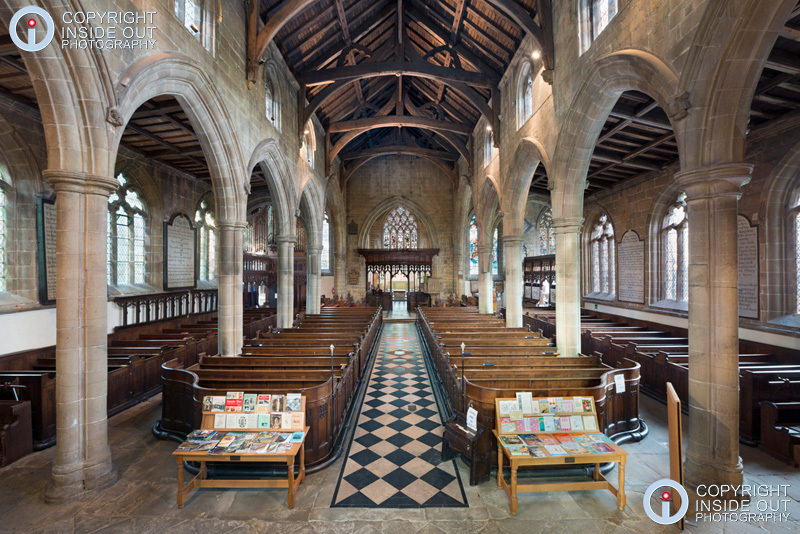 The project began with the single interior photograph shown directly below, taken of the church by local professional photographer Bernard O'Sullivan. "When this first high-resolution hand-lit image was enlarged and examined closely, intriguing glimpses of carvings could be seen. I simply had to take a closer look! Using powerful photographic lighting and a telephoto lens 6.8 times more magnified than human eyesight I scoured the darker recesses of the church interior, the more I looked, the more was found, the 'shoot-list' seemed to grow by the day. Sometimes being on your own in a building of this age, especially in the darker months, could feel creepy. However I personally never sensed anything other than positive vibes from this peaceful, friendly space. So after approximately thirty-two days of photography and post-production, we have amassed over 300 images of which a selection are reproduced here. A Hidden Gems coffee-table photo-book is also under way and it is hoped will be available early in 2018"
View more images using the links below. In common with a lot of medieval buildings, the interior of St John The Baptist has a host of high-up dark recesses. The interior of the church is the result of approximately sixty-five separate exposures, with different parts of the church being selectively hand-lit, before being combined. It was at this stage that details were noticed in the roof that needed further investigation. Exquisite details high up in the roof are revealed when viewed at close quarters under good lighting conditions. 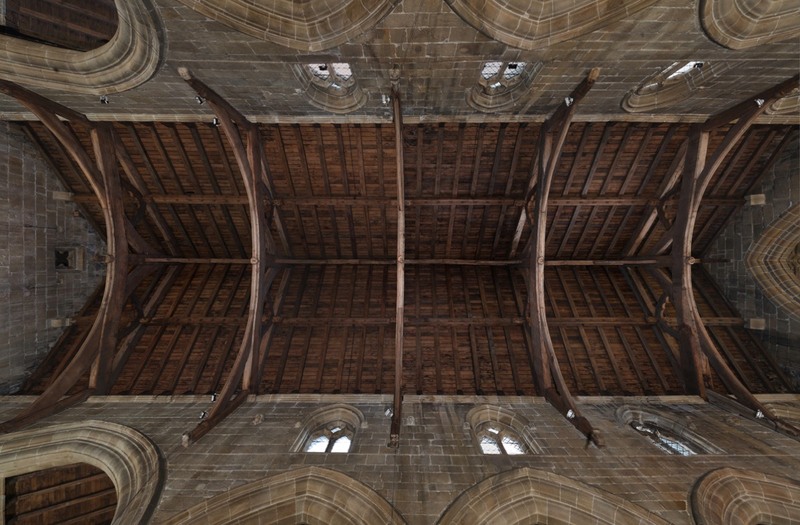 The carvings in the central naves aisle roof are caved out-of-the-roof-beams, not installed after construction. These intriguing carvings date back to the time of building approximately six hundred years ago. 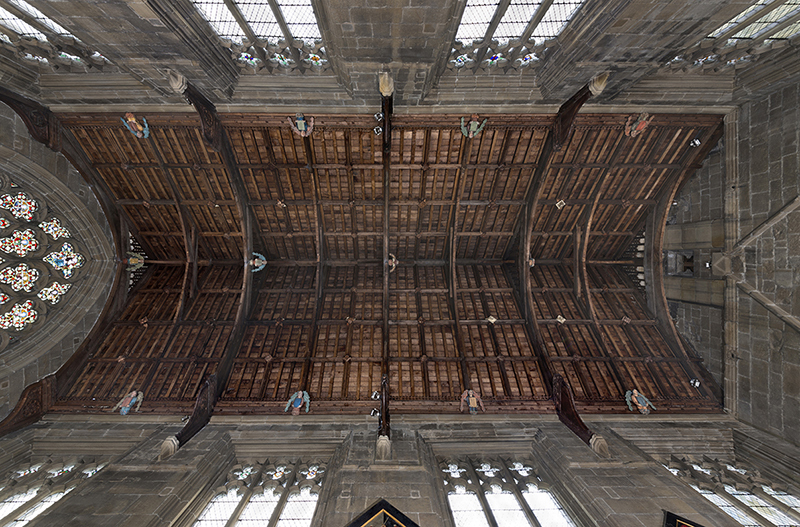 The Chancel roof isn't the original, but is still decorated with some beautiful wooden carvings, including 12 angels. When viewed on a bright day there aren't many things as colourful as a beautifully crafted stained glass window. The windows have been photographed in their entirety and also in close-up sections revealing the depth of vibrant detail. Click here or on image to see more. There is a whole host of example of the creative arts all around the church, from Floor Brasses, Wall-Decorations, Organ and Pew Carvings, and Tombs and Furnishings. St John The Baptist Church in Tideswell, also know as 'The Cathedral Of The Peak' is one of the UK's most significant churches dating back to 1395. 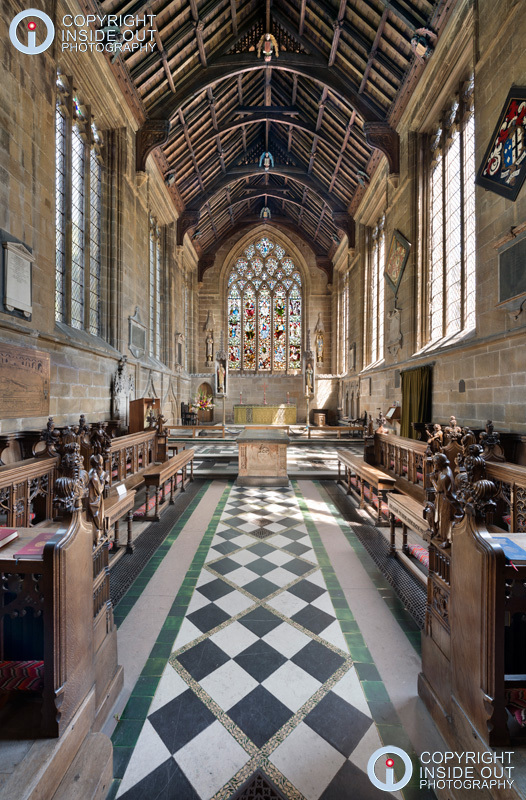 In 2017 The Friends Of St John (FoSJ) charity was formed with the aim to promoting public knowledge and interest in he church, and to help raise funds to maintain the fabric of this magnificent building. Get Involved - If you are interested in helping to preserve this building including the carvings on this page, please visit the FoSJ site find out more about FoSJ and how to get involved. Get Involved - If you are interested in helping to preserve this building including the organ carvings on this page, please visit the FoSJ site find out more about FoSJ and how to get involved.